SAINT ALEXANDER (1799) The Russian vessel Saint Alexander was lost between Alaska and Siberia in route to Okhotsk, in 1799. The vessel, all hands and a cargo of furs were lost. SAINT GEORGE (1876) The 392 ton whaling ship Saint George was caught in the ice and abandoned northeast of Pt. Barrow September 12, 1876. The vessel was out of New Bedford, Massachusetts and valued at $36,000. Her cargo was 1,400 barrels of whale oil and 1,800 pounds of whale bone worth $43,000. SEABREEZE (1872) The 473 ton whaling vessel Seabreeze was abandoned in the Arctic in 1872. The crew may have returned and rescued the vessel. The Seneca had a value of $70,000 at the time of the disaster. 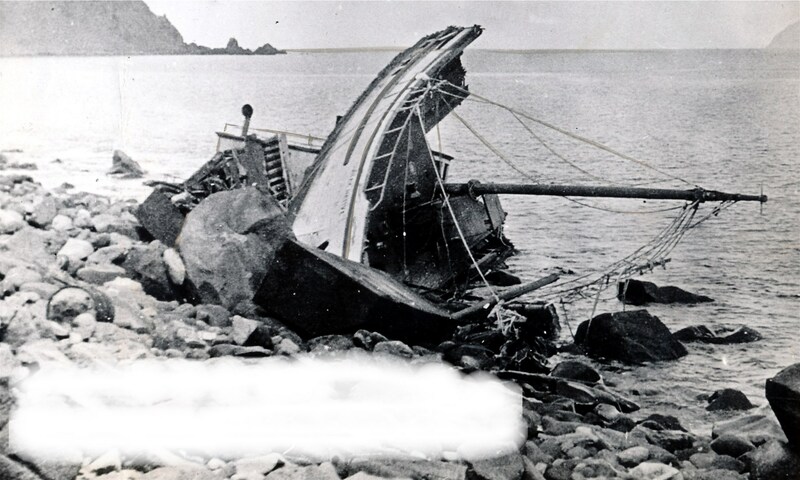 SPY (1890) The 17 ton 41 foot wooden sloop Spy was crushed in the ice and lost at Point Barrow at 4 p.m. Tuesday November 25, 1890. The crew of 4 was putting the vessel in winter quarters when the disaster occurred. The Spy was in ballast with no cargo. Conditions at the time were said to be dark with a moderate northeast gale. The crew could do nothing for her and the vessel went to pieces. The Spy was valued at $3,000 and was a total loss with no insurance. No lives were lost.